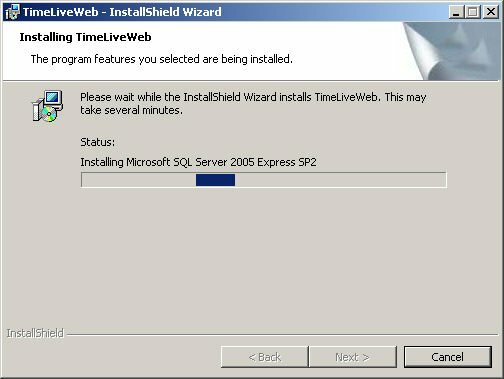 TimeLive installer automatically installs [SQL Server 2008 Express Database] engine during standard installation. SQL Server 2008 Express can be removed from the installation by choosing “Custom” installation in feature selection dialog box. If [SQL Express 2008 Express Database] is not selected in installation, TimeLive then first show a “TimeLive database setup page” which allows creating and setup TimeLive database on any standard SQL Server 2000, 2005, 2008 server which is already running in the organization. This setup page creates a new TimeLive database with all necessary tables and default data. 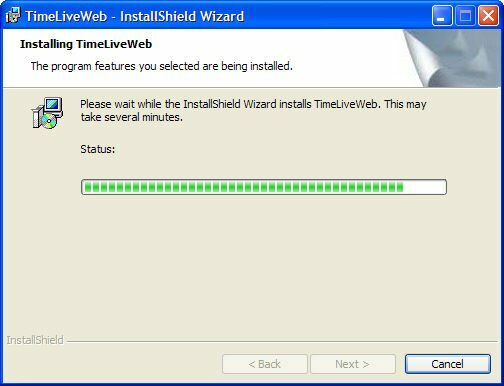 TimeLive automatically install its own internal web server (Cassini), if there is no IIS already available on the system where TimeLive is being installed. 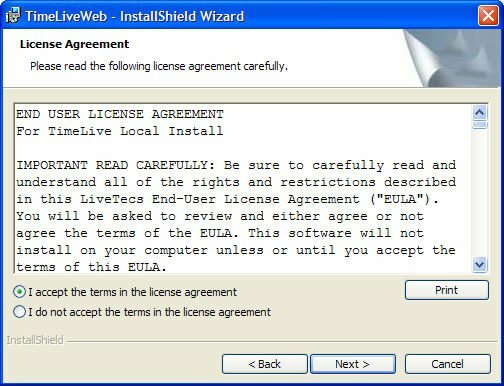 Download the free version of TimeLive from Livetecs website and save it to your local computer. 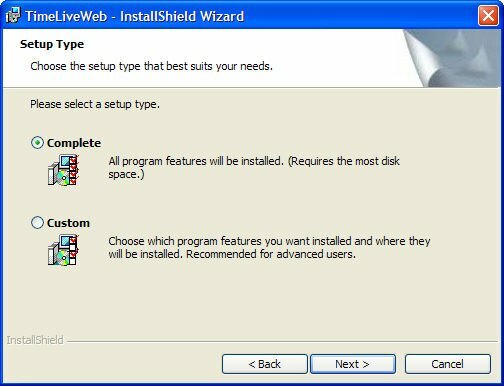 Double click on TimeLive installation file to launch TimeLive Setup Wizard. 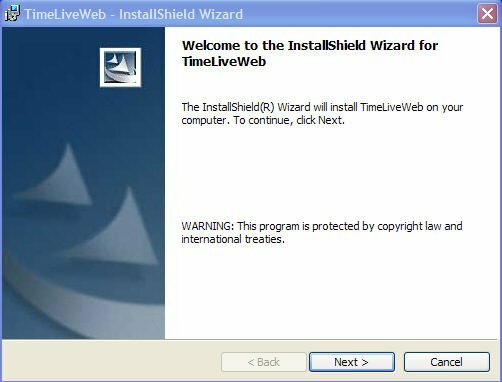 When the TimeLiveWeb – InstallShield Wizard window displays, select the [Next] button. Read the license agreement. If you agree to its terms, select the [I accept the terms of the license agreement] radio button, and then select the Next button. 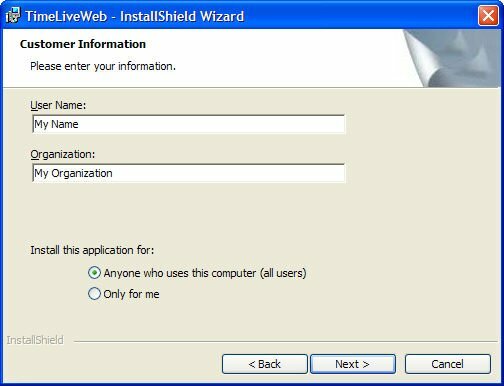 The installation program checks for the presence of Microsoft Windows Installer, Microsoft .NET Framework 2. If these necessary components are not present, the following window displays. Enter your name and your organization name and then select the Next button. Select [Custom] if SQL Express engine is not required in the installation. Select the [Complete] radio button, and then select the [Next] button. A status showing that TimeLive is first installing “Microsoft SQL Server 2008 Express” on the machine. A Setup Status window displays that track the progress of the installation. TimeLive requires that Microsoft Data Access Components (MDAC) be installed on your machine. 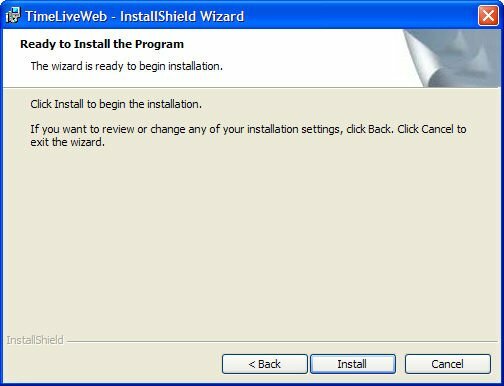 At this point, the installation program will check for the presence of MDAC and automatically install it if it is absent. This may take a few minutes. Once MDAC is installed, the computer may need to be restarted. The installation will automatically resume after the computer is restarted. 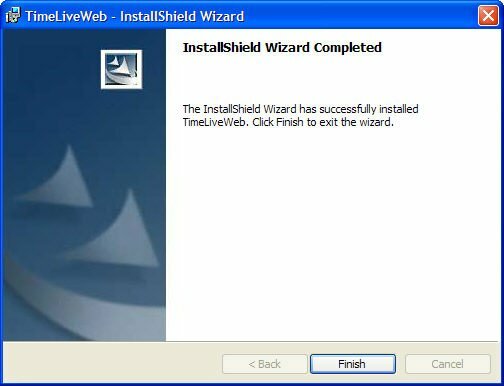 The InstallShield Wizard Complete window displays to indicate that installation was successful. To exit the installation program, click on [Finish] button. TimeLive install SQL Server 2008 Express engine with instance name “TimeLive”. This instance can be removed from the system using add/remove program in your control panel. Please continue reading to “Launching TimeLive (First Time)” in order to launch TimeLive. In case of installation without SQL Server 2008 Express engine, TimeLive first open database setup page when launch first time. Using database setup page, a new database can be created as well as the already existing database can be pointed to the TimeLive application. Please continue reading to “TimeLive database setup” for setting up the TimeLive database.